Welcome to Haiku, Thursday mornings at 8:00 until 9:30 AM. I will be cultivating my life forces at the Fourth Marine Division Park, AKA Giggle Hill. I come to this park often and really love the energy here; the sunrise over Haleakala…with the cool morning breeze awakening the trees! This is a perfect environment for Zhan Zhuang, Yiquan and Taiji. Start Simple each day. Tune your breathing, find your center and open your mind and body to an adventure within. I am currently teaching the Wudang Taijiquan Long Form as well as a very primordial Wudang Wuji Hun Yuan Qigong, this would be a great opportunity to learn the rare and beautiful Wudang style taiji. The qigong set will focus on the Three Dantians and the Eight Extraordinary Vessels. I am always happy to help get you started on the Way. Sunday Morning we are going whale watching! I will let everyone know what boat/harbor and how many spaces we will have available as well as the price. This should be lots of fun hanging out being social and checking out whales. Sunday Night join us for a pot luck luau on the beach, location to be announced soon. This was a fantastic night last year! Tuesday Master Zhou will be at Kaunoa for a “just for seniors” qigong group lesson, the last I checked (Jan. 31) there was room for 6 more students. The cost and payment is at Kaunoa $17.00 call 270-7308 to book. Wednesday, Thursday and Friday will be our exclusive Taiji Workshop. 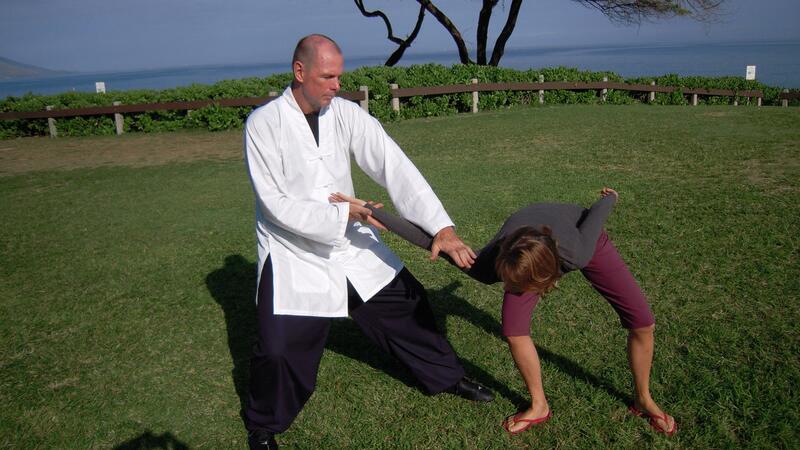 There will be two 2 & 1/2 hour classes each day focusing on Wudang Taiji principles and form. Any Taiji student will gain a lot of personal time and instruction from Master Zhou regardless of what forms you know already or are learning or your level of experience. Wudang methods will help you take your Taiji to the next level. There will be plenty of time for questions and a lunch break between the two sessions each day. 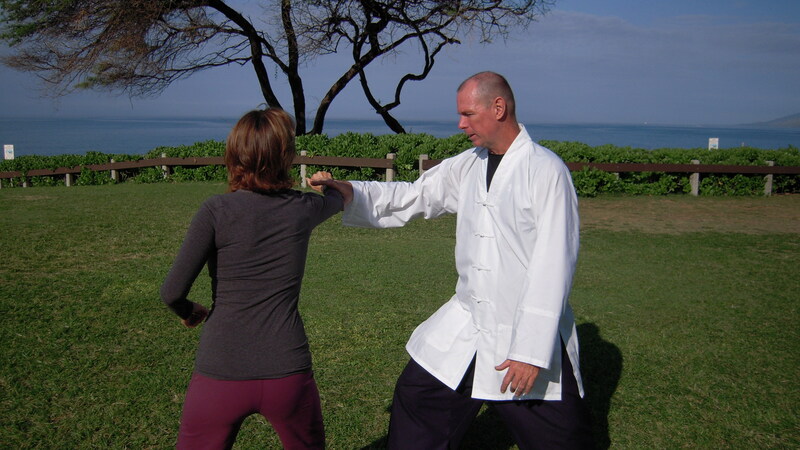 The Cost will be $35.00 per class or $70.00 per day and will also be at a private venue in Kihei. Please help us by supporting this fantastic “Second Annual” workshop with a living treasure from China. Those of you that have never met master Zhou are in for a real treat! Those of you that came last year already know Xuan Yun and Julie are more than emissaries from Wudang Mountain…they are personal friends. The best way to reach me is to go here and leave a comment. Millions of people have benefited from Taiji training and yet many have not been able or have not felt able to participate. Now almost anyone can participate in a Taiji program. 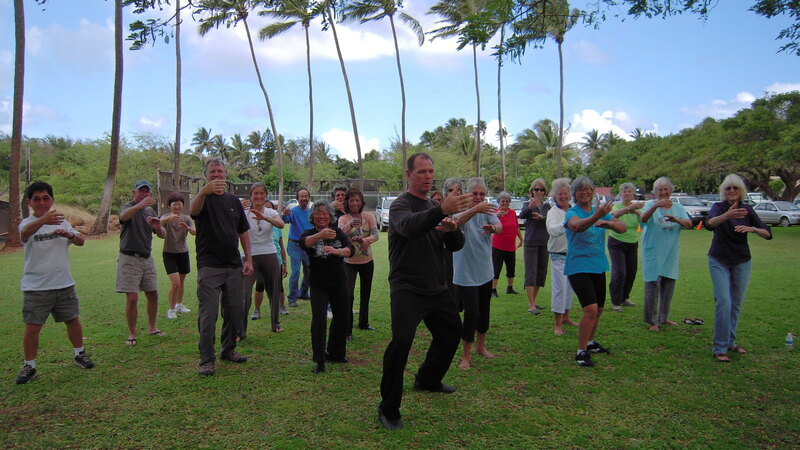 For years, I have done classes at retirement homes like Roselani Place and Kalama Heights and I had found a way to bring Taiji to those that have a limited range of movement by simplifying the form. Many of my students cannot stand or walk and yet it has been possible for me to share these life-changing arts with them in this way. Recently Dr. Paul Lam has designed a system specifically for students in this situation and I have received training from one his trainers. I feel this is an excellent program as it allows everyone to learn some Taiji and is fully accredited by the Arthritis Foundation and backed up with medical evidence as to its efficacy. Having this accreditation is important for application to people with “special needs”. I am pleased to announce that I will be offering this program at Kaunoa in Sprecklesville starting immediately every Wednesday from 1:00 to 2:00 PM. For many new students this will be a boon, finally giving them an opportunity to benefit from Taiji. If you have been holding back because you have felt unable to join before, now is the time to check it out. In addition, for existing students, please tell your friends about this new program it is so simple they can even participate while sitting down. This program uses a very simplified set of Qigong movements and Taiji form. Derived from the “Sun” (pronounced “soon”) Style it roughly follows the same structure as the Yang style and a beginner could easily learn this style and then segue into Yang Style later. Frankly, I enjoy doing this form as it is performed very slowly and with a minimal amount of stepping which gives it a feeling almost similar to zhan zhuang training. Proponents of zhan zhuang like Fong Ha and those of you that attended my workshop with him will understand what I am saying. This program is not intended to replace any of my other training options. I feel Yang Style is still the best for most people and I would not recommend you give up on that practice. Still, my heart goes out to those that up until now have not been able to do my regular classes, and so, at last I have a sanctioned option for those people to discover the wonders of Taiji. What an amazing week many of us just had! Personally I am still coming to grips with all that we did and all that I learned after living side by side with Master Zhou and his wife Julie for an entire week. Thank you Master Zhou for your dignity and grace throughout the week sharing your life changing energy with all of us. Thank you everyone that supported this adventure into the mysteries of Tao. From the philosophy, the story of a humble upbringing, the history, the spiritual practice and all the way to Qigong and Taijiquan practice it has been quite a week. We are so very blessed to have Xuan Yun as a teacher. We are working on getting another visit next year and this is entirely because of your love for these traditional arts. Thank you Julie for making it all possible! Two New Qigong practice sessions each week! 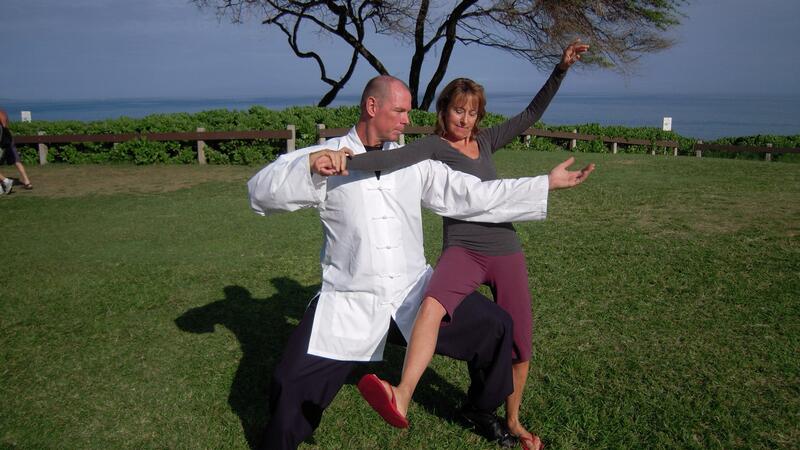 January 17th & 18th I will be doing a Tai chi for Arthritis Workshop at Kaunoa, call 270-7308 to sign up! Monday at the West Maui Senior Center on Lahainaluna street in Lahaina. Tuesday at the Hui Aloha area (down near the beach road) inside Keopuolani Park in Kahului. Tuesday at the Kaunoa Senior Center (seniors only) in Sprecklesville Maui. Wednesday In Kihei-Wailea area; Semi-private: Space available, contact me for more information. Wednesday at the Kaunoa Senior Center (seniors only) in Sprecklesville Maui. Friday at the Kihei Community Center’s Aquatics Center classroom next to pool. Private and Semi-Private Classes available, contact me here and leave a comment. In addition he will appear at the Wo Hing Temple in Lahaina on the evening of April 21st this will open to the public, donations accepted. Zhou, Xuan Yun grew up on Wudang Mountain in China. 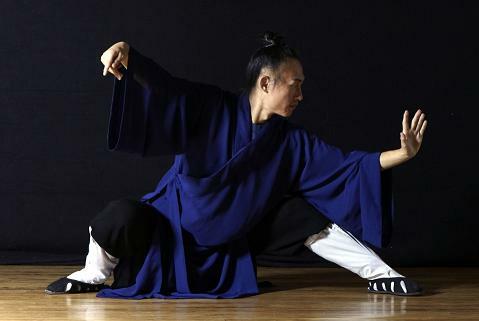 The Taoists from Wudang are world renowned for their martial arts and for the spiritual path that they follow. The monks at Wudang spend many years training Kung Fu, Taiji, Qigong and Taoist arts for most of everyday. Many people train at Wudang and yet only a few are ever allowed to teach these arts. He has a fun, energetic style and his translator wife will accompany him. While at the Workshop on Maui, Master Zhou will spend the first day covering basic concepts about the Taoist arts and have a question and answer session. Later he will teach some Taoist Qigong to the group. The next three days he will teach the first section of the Wudang Taiji long form, including the forms and the martial applications. The Wudang form has elements of Yang style and Chen style Taiji embedded in it and takes the Taiji player into the traditional realm of the origins of Taiji. Students of Yang style will find this form closely matches what they have been learning with a unique feel and applications. Xuan Yun will give his unique perspective that only someone with his background can give. The price will be $35.00 per class ($70/day) or $270 for all four days if you pay during February. The price will be $45.00 per class ($90/day) or $350 for all four days if you pay after February.